Do not accept any of the sides, we try to weigh the pros and cons of online casino activity and even come to a conclusion at the end of the discussion. The list below will deal with 3 principal notions to understand: money, time and access. Let's start with the last one. So, the Access. Lets' follow the procedure of playing in the land casinos: you start the engine of a car, run lots of kilometers through the scorching desert, park a car, book the room in the hotel, change your clothes (optional) after a long-day driving, leave the building and enter the casino. Then you change your money (long line is obligatory), look for a place to game, gazing celebrities (optional) and etc. And now let's consider the online casino gaming: you leave the bed, switch on the PC, make coffee, and launch the browser. Then just play. Conclusions are obvious, aren't they? Time. You may re-read the paragraph given above and figure out how much time will it take for you simply to get your final destination - playing table/machine. Isn't it better for you to spend your time with your family or girlfriend instead of chasing for money on the other side of a country? Value your time! Appreciate your being with close people. And sometimesâ€¦ just sometimes visit online casino to play blackjack game and relax. You have money to burn? You may omit this paragraph indeed. Otherwise you will admit the expenditures which possess all this hotels/planes/service stuff. Wanna get to the casino to play? Buy tickets, book rooms, buy food and drink. It is worth much indeed. And if you perform online casino activities the money problem disappears as it is. Everything is much clearer here. 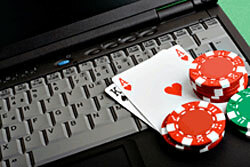 Online casino performance lacks drive, action, adrenaline and just atmosphere no doubt. The virtual reality will never displace the real live in 100%. Thus the air, the setting of the land casino is hard to copy with monitor screen and mouse device only. That's the story. Still you may use online casino gaming as a principal training ground (to learn blackjack in particular) for your future deeds at the gambling house table.